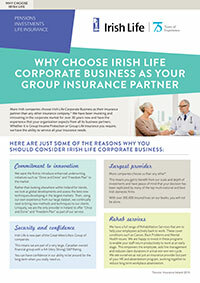 More Irish companies choose Irish Life Corporate Business as their insurance partner than any other insurance company. * We have been investing and innovating in the corporate market for over 30 years now and have the experience that your organisation expects from all its business partners. Whether it is Group Income Protection or Group Life Insurance you require, we have the ability to service all your insurance needs. 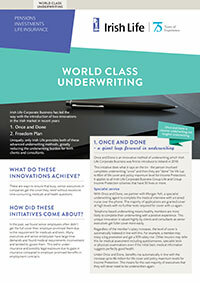 We were the first to introduce enhanced underwriting initiatives such as “Once and Done” and “Freedom Plan” to the market. Rather than looking elsewhere within Ireland for trends, we look at global developments and assess the best new techniques developing in the largest markets. Then, using our own experience from our large dataset, we continually seek to bring new methods and techniques to our clients. 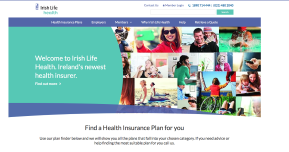 Uniquely, we are the only provider in Ireland to offer “Once and Done” and “Freedom Plan” as part of our service. More companies choose us than any other*. This means you get to benefit from our scale and depth of investments and have peace of mind that your decision has been replicated by many of the top multi-national and best Irish domestic firms. 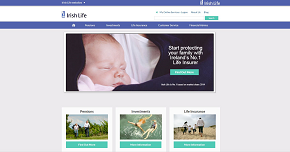 With over 300,000 insured lives on our books, you will not be alone. 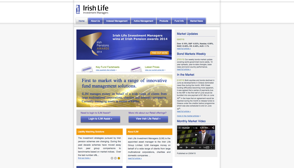 Irish Life is now part of the Great-West Lifeco Group of companies. This means we are part of a very large, Canadian owned financial group with a AA (Very Strong) S&P Rating. You can have confidence in our ability to be around for the long term when you really need us. 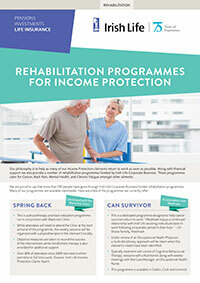 We have a full range of Rehabilitation Services that aim to help your employees actively back to work. 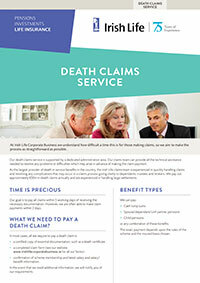 These cover conditions such as cancer, back problems and mental health issues. We are happy to invest in these programs to enable your staff return productively to work at an early stage. This empowers the employee, aids line management and reduces claim durations in a true win-win-win cycle. We see ourselves as not just an insurance provider but part of your HR and absenteeism program, working together to reduce long term workplace absenteeism. 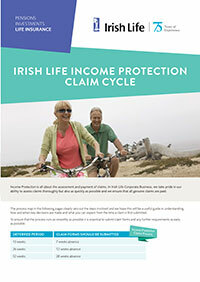 We have all the claims management knowledge and ability in-house with a staff of over 40 Income Protection experts. We don’t rely on external parties to assess or manage claims, other than specialist doctors for independent opinions. 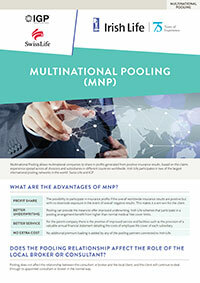 This gives us greater control and flexibility over our processes. Click on any of the following documents to find out more. 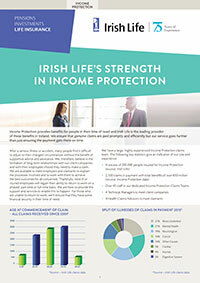 Whether you are an existing client, thinking of making the move to Irish Life Corporate Business or if you want to discuss any part of our group insurance offering, contact our Executive Manager (Risk and Longevity Products) Shane O’Farrell on 01 704-2869 or shane.ofarrell@irishlife.ie. Information correct as at June 2015.